To see if any quakes occurred near a certain spot on the seismogram, just click the center of the trace line close to the event of interest. If any quakes were recorded between three minutes before your click and thirty seconds after it, they'll show up on the report. Just remember: quakes can go unreported for three or four days, depending on when they get around to them; the latest quake I have occurred at 22:48:51 on 2011/08/17 (MST). And it's present throughout most of the siesmos in the area, seems to be focused towards the southeast of the old caldera. Watch to see if the signal gets stronger and develops shortwave harmonics. Mount St. Helens is also getting active. A 5.1 set off Mt. St. Helene's. Before Pinatubo there were several smaller quakes like the one's we are seeing at Yellowstone. 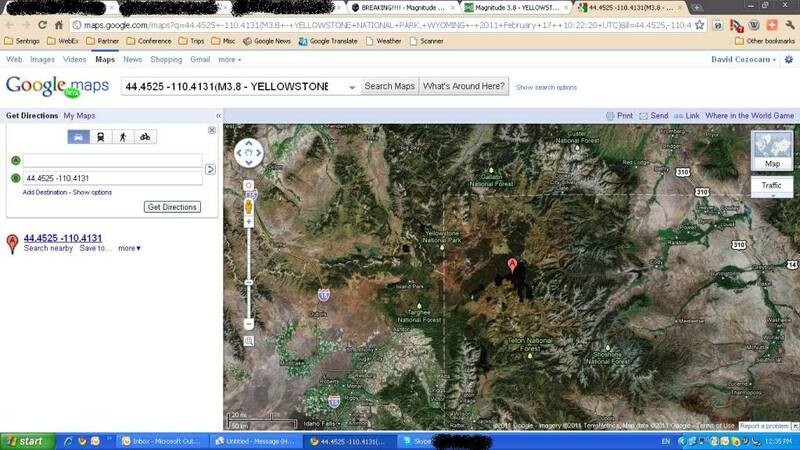 The Yellowstone caldera is only 5 miles deep, a quake at .9 could easily mean there is magma moving to the surface. We are only seeing the beginning of this today, we did not receive the full affects of the Solar flare, see below. Could An Eruption Of The Yellowstone Supervolcano Destroy The United States As We Know It? When most Americans think of Yellowstone, they tend to conjure up images of Yogi Bear and "Old Faithful". But the truth about Yellowstone is much more frightening than that. 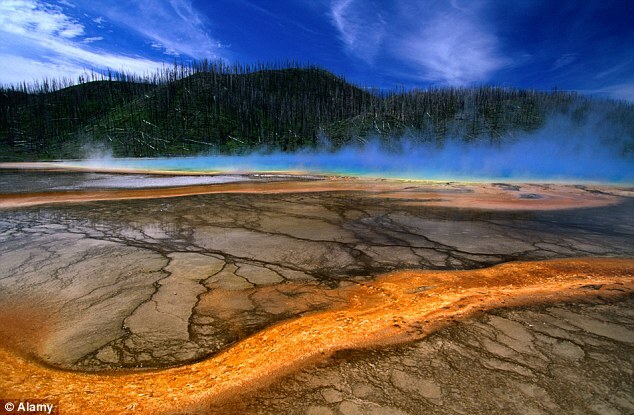 Yellowstone National Park in Wyoming is actually sitting right on top of a massive supervolcano. This supervolcano has erupted before, and scientists tell us that when it fully erupts again it will destroy the United States as we know it. So could such an eruption happen any time soon? Well, scientists tell us that Yellowstone is actually overdue for a major eruption and there are thousands of earthquakes in the Yellowstone area every single year. In addition, scientists that monitor Yellowstone have been quite alarmed that some areas of Yellowstone have risen by as much as ten inches over the past few years. So yes, there are some good reasons to be really, really concerned about what is going on at Yellowstone. The truth is that the Yellowstone supervolcano is the biggest volcano in North America by far. A major eruption at Yellowstone would permanently change all of our lives in just a single day. In fact, a major eruption at Yellowstone would permanently end America's status as a superpower in just a single day. So exactly what would an eruption of the Yellowstone supervolcano look like? What exactly would a full eruption of the Yellowstone supervolcano mean for the United States and for the rest of the world? #9 The "volcanic winter" that a massive Yellowstone eruption would cause would radically cool the planet. Some scientists believe that global temperatures would decline by up to 20 degrees. #11 Scientists tell us that it is not a matter of "if" Yellowstone will erupt but rather "when" the next inevitable eruption will take place. Utah's Bob Smith, a longtime expert in Yellowstone's volcanism. Exploding with a force a thousand times more powerful than the 1980 eruption of Mount St Helens, the super-volcano beneath Yellowstone National Park would spew lava far into the sky and dump a layer of plant-killing ash 10-feet-deep up to 1,000 miles away. Imagine what 10 feet of ash would do to the lakes and rivers, even to the oceans. Say goodbye, fish. Say goodbye, cattle. Say goodbye, crops. Say hello, ice age. "Two-thirds of the U.S. could become uninhabitable as toxic air sweeps through it, grounding thousands of flights and forcing millions to leave their homes," says journalist Daniel Bates. I don't think it would force them to leave their homes. I think they'd die in their homes as their roofs collapsed. Volcanic ash is much heavier than snow. "This is the nightmare that scientists are predicting could happen if the world’s largest super-volcano erupts for the first time in 600,000 years, as it could do in the near future," Bates continues. "Yellowstone National Park’s caldera has erupted three times in the last 2.1million years and researchers monitoring it say we could be in for another eruption. "They said that the super-volcano underneath the Wyoming park has been rising at a record rate since 2004 - its floor has gone up three inches per year for the last three years alone, the fastest rate since records began in 1923. "But hampered by a lack of data they have stopped short of an all-out warning and they are unable to put a date on when the next disaster might take place. "But he added: ‘Once we saw the magma was at a depth of ten kilometres, we weren't so concerned. "Since the most recent (super volcanic) blast 640,000 years ago there have been around 30 smaller eruptions, the most recent of which was 70,000 years ago." I wonder how many of those smaller eruptions coincided with the ice-age cycle? 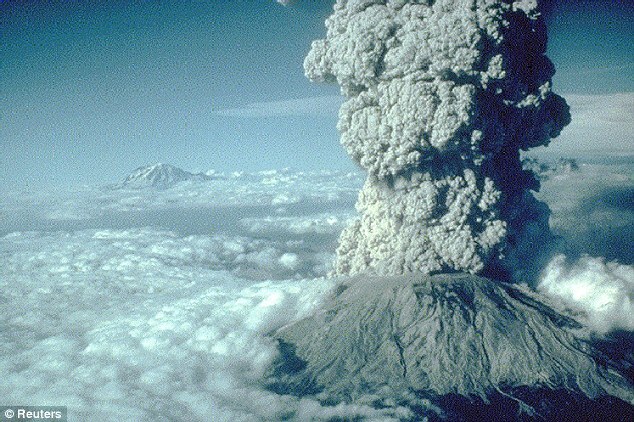 July 22, 1980: Mount St Helens in Washington erupts. Is the world's largest super-volcano set to erupt for the first time in 600,000 years, wiping out two-thirds of the US? The super-volcano beneath Yellowstone National Park in Wyoming has been rising at a record rate since 2004. ‘Clearly some deep source of magma feeds Yellowstone, and since Yellowstone has erupted in the recent geological past, we know that there is magma at shallower depths too,’ said Dan Dzurisin, a Yellowstone expert with the U.S. Geological Survey at Cascades Volcano Observatory in Washington State. A 5.1 set off Mt. St. Helene's. Before Pinatubo there were several smaller quakes like the one's we are seeing at Yellowstone. The Yellowstone caldera is only 5 miles deep, a quake at .9 could easily mean there is magma moving to the surface. Given that the quake on 2/17/11 was 1 mile deep it appears that magma is moving to the surface. 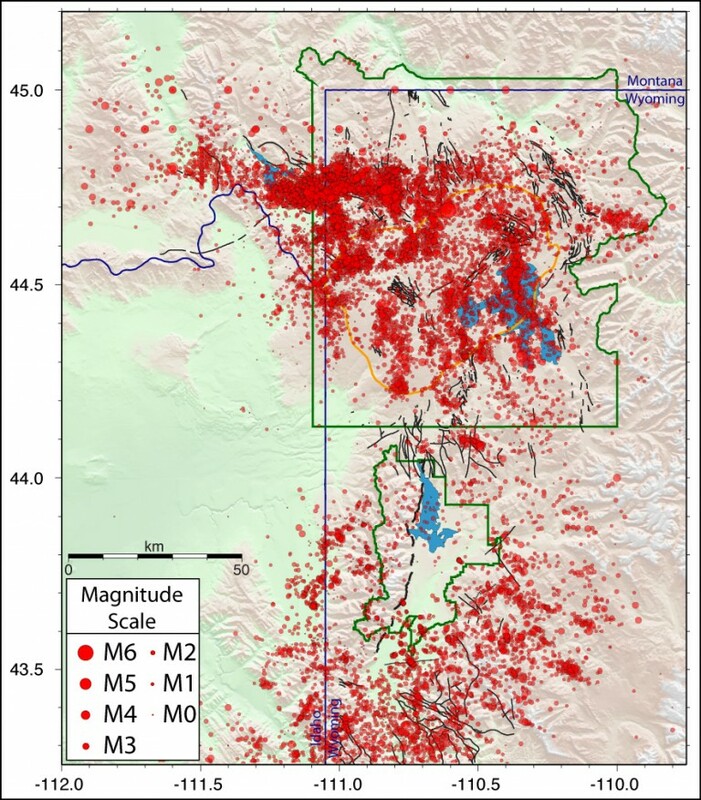 Notice the cluster of quakes in the Montana area and the one down in the New Madrid Fault along with all of the quakes in California and North east Washington/Oregon. This is the data that is no longer being reported at this link http://neic.usgs.gov/neis/qed/. Although the quakes are registered on the world maps they stopped reporting this data on February 17th. Why? Earthquakes recorded by University of Utah Seismograph Stations for the last week (168 hours). Times are local (MST or MDT). Most recent earthquakes are at the top of the list. Click on the word "map" or "MAP" to see a map view. Click on a "DATE" to get additional text information. Magnitude 3 and greater earthquakes are printed in bold type. The top three magnitudes greater than or equal to 3 are in red. USA VOLCANO UNREST : Mount Saint Helens, Mt. Baker, California and YELLOWSTONE NOT BEING REPORTED IN MSM! Major harmonic tremors showing up in Yellowstone Lake area where there is actual movement in the ground of lava. ALL TODAY ! wow.. February 28, 2011... links below... this is ON TOP of the Greenbrier / Guy / Beebe Arkansas swarm. The quakes in both YellowStone and Alaska are been becoming more and more shallow. That happens and We've averted the ET Communications Timeline at least up to that Point. The latest communication on this is that it will be a small eruption. The most dangerous period is between the 18th and 22nd. You can't Blame Me for the effort can Ya ? Actually a small eruption may be of benefit given how much the lava has risen under the lake. Small is much better then ELE. Well then hopefully this second one at YMR Station is also of benefit. What Magnitude are They as Its hard to tell by the Charts. You're talking about the Madison River Seismograph right ? Yellowstone has been rumbling a lot lately. In looking around the Park though - The rest of the Park seems pretty quiet compared to the Madison River Seismograph don't You think ?